Barcelona Need To Offer This Star A New Contract And Soon! A superb performance against Valencia in the Copa Del Rey semi-final and Samuel Umtiti has reminded the Barcelona board how important it is to offer him a new contract. With a shortage of high-class defenders out there in Europe, Barcelona boss Ernesto Valverde needs to make sure Samuel Umtiti remains far off the transfer market. The French centre-back has improved immensely since arriving at the Catalonian club in 2016 from Ligue 1 outfit Lyon and Umtiti is looked at a future star for the La Liga giants for many more years to come. Despite Umtiti’s Barcelona Contract running out in 2021, there is no pressure on the club to extend a new deal for Umtiti as the solid defender is relatively happy at the Blaugrana. But one of the best defenders in the world will surely attract interest from rival clubs across the continent. At 24 years of age, Umtiti has already established himself as a first-team regular at Barcelona but is paid the least in comparison with the other superstars on the team-sheet. However, his payment does not justify his value in the side as he has been one of the standout players for Barcelona this season. 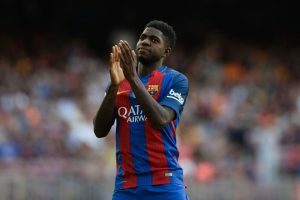 Umtiti’s release clause is currently around €60 million at the moment, which is quite an affordable price for the clubs’ with deep pockets. Manchester United boss Jose Mourinho is renowned to spend lavishly on signings and Umtiti is a prime target for the Portuguese boss in the summer. But Barcelona is reportedly in the process of preparing a two-year contract extension for Umtiti in the summer to keep him in familiar surroundings at Barcelona which would see his release clause rise up to €200 million along with a better salary. This is a clear indication that Barcelona wants to keep Umtiti for a long time indeed, the French defender has been an absolute beast for Valverde at the heart of the Barcelona defense. And the best way to keep out another club’s interest is to secure a new deal with a player, which the Catalan’s will be doing soon enough. The post Barcelona Need To Offer This Star A New Contract And Soon! appeared first on The12thMan.